Google has been adding a lot of cool features to its Google search. In the latest move, the tech giant has added a new “Events” view for Google Search on mobile that shows enhanced search results for local events with the help of websites like Eventbrite and Ticketmaster. This new feature would also let users find results according to their current location and other contributing factors for the search. A nifty feature for travelers, we say! 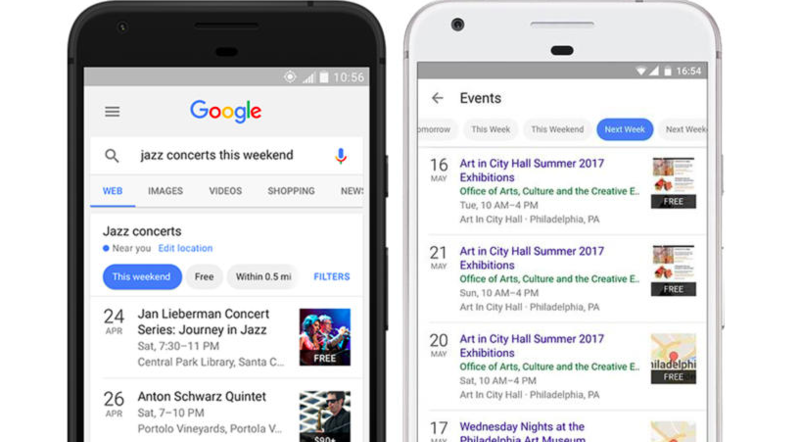 For example, if you search “art events this weekend” or “jazz concerts in Austin” the Google search will show your new Events card as the first result for the query. You can expand this view by tapping on “More Events” to see more info for the events on a full screen of your phone. The full view would also let you filter the dates for the event results. The information presented in the Events cards offers users with an easy summary for the event, accompanied by details about events’ title, date and time, and location. Once you select an event, Google search would redirect you to the official event website or app so that you can purchase tickets and book your slots. With today’s launch of this new feature, Google has forged a substantial partnership with events’ information providing websites like Eventbrite, Ticketmaster, Meetup, Vividseats, Jambase, LiveNation, Burbio, Allevents.in, Bookmyshow.com, StubHub, Bandsintown, Yext and Eventful. These websites would be the information provider for the feature, and the details would be presented on a clean card view. “Events” feature is being rolled out today on the Google app for both Android and iOS along with the mobile website for Google in the US. It can have all the local events listed on the card as Google is providing developer guidelines for making sure that all the events get listed on the new view. This new feature could serve as a great tool for planning our weekends. Earlier, Google used to show limited events, but now with this feature, you will see all the local events happening around you. Just another great addition to Google search!